Received a damaged or incorrect product? This doesn’t usually happen here. We have a strict quality check on all orders prior to packaging. If that’s the case let us take care of it. Step 1) Received a damaged unit? Let us know within 5 business days of delivery. We’ll refund you for the damaged units, and you can keep the others. Step 2) Wrong item? 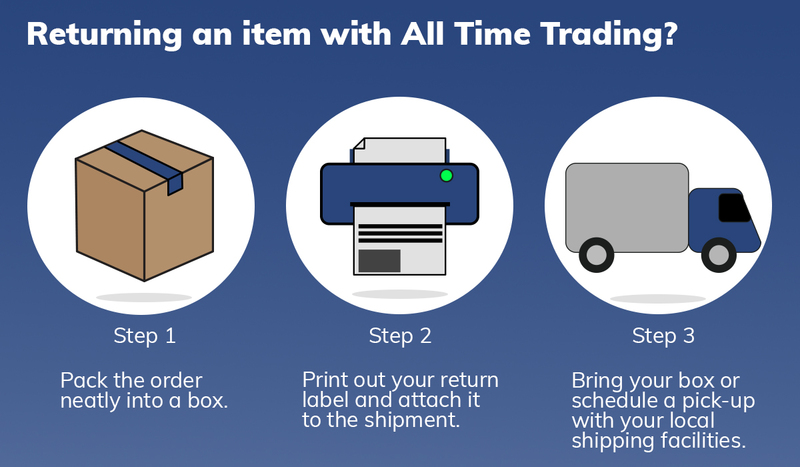 Contact us within 5 business days of delivery, we’ll send you a return label via email, and ship out the correct order once your return reaches our warehouse. Step 3) Received the right shipment with all units unharmed, but you simply want to return it? You can return the part or the whole order; however, there will be a 25% restocking fee + return shipping costs. Although we sell to all retail, online sellers, organizations, and individuals our prices and case packs reflect the business model of selling to other businesses. To maintain minimum bulk case packs at low discounted rates for you, our return policy must reflect that. The 25% restocking fee is our compromise to offer our low prices and quality items to individuals. We understand that most wholesalers don’t offer returns; however, we see fit that we offer returns with attainable means.